28-Jul-2017 -- While on the way home from a mountain biking trip to Downieville (in the Sierra Nevada mountains), I passed through Marysville/Yuba City, and realized that - with just a short detour to the west - I could revisit this Degree Confluence Point (that I had previously visited back in June 2008). Once again, I was able to drive along farm roads to a point just 100 m east of the point, which lies within a farm field. When I previously visited this point in 2008, the field was just bare dirt. Other visitors had reported a crop of wheat, the remains of a crop of carrots, and a field of grass (used for hay). This time, however, the field was filled with a crop of sunflowers. California’s Central Valley is one of the most productive agricultural regions in the nation. It’s interesting to see how a single field can be used for such an eclectic range of crops. Although this point is located within a flat field (within California's vast Central Valley), it is noteworthy for its proximity to the Sutter Buttes, which are a small range of eroded volcanic lava domes that stand out among the otherwise flat valley. Previous visitors - including I - had wondered about the unusual name of the nearby town: College City. The town is far, far short of being a ‘city', and doesn’t have anything remotely resembling a ‘college’. The town’s Wikipedia entry now contains an explanation: The town was briefly the site of a small Christian College in the late 1800s. #5: The confluence point lies in a farm field. 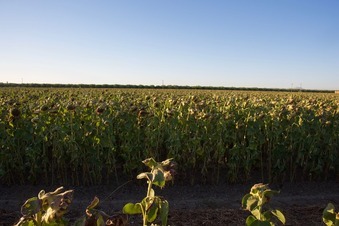 During this visit, the field had a crop of sunflowers.